Synopsis: An ageing air hostess tries to turn a potential drugs bust to her advantage with the help of her lovestruck bail bondsman. Quentin Tarantino was always going to find Pulp Fiction a tough act to follow, so it’s no surprise that his third movie as both screenwriter and director received a mixed reception upon its release in 1997. Adapted from crime maestro Elmore Leonard’s novel Rum Punch, Jackie Brown was Tarantino’s first screen adaptation of another writer’s work, which naturally meant that, although Leonard’s plot-heavy crime sagas were populated by the same type of low-life criminals speaking the same hip street dialogue that are found in Tarantino’s movies, the director’s own unique voice would inevitably be compromised to some degree. Jackie Brown is noticeably more restrained than either Reservoir Dogs or Pulp Fiction, and only one character from this movie – Samuel L. Jackson’s (Cell, The Legend of Tarzan) memorably outspoken firearms dealer, Ordell Robbie – wouldn’t be out of place in either of Tarantino’s earlier movies. But that doesn’t make Jackie Brown a lesser film than its predecessors – in fact, it arguably ranks amongst the best of his work to date, simply because it lacks their violent excess. Although Jackie Brown’s tone might be relatively subdued, its characters are just as colourful as those found in Tarantino’s earlier movies. The title character is a jaded 44-year-old air hostess, a woman of lived-in beauty who maintains a hard-edged dignity in spite of the knocks life has dealt her. She’s played to perfection by 1970s Blaxploitation queen, Pam Grier (3 A.M. Posse), one of those actors who is nearly always superior to the material they are given. Jackie works for a third-rate Mexican shuttle airline, and makes a few extra dollars smuggling dirty money across the border for Robbie, but she’s uncomfortably aware that the years are closing in on her, and that life is only likely to get harder. Things take a turn for the worse for Jackie when she’s pulled in by a couple of cops acting on a tip-off from one Beaumont Livingston (Chris Tucker – Dead Presidents, Rush Hour), an associate of Robbie’s, who is canny enough to know Livingston will sing to stay out of jail, and so pays his bail solely so he can kill him before he spills too much. Things look particularly bleak for Jackie when Robbie pays a late-night visit to her flat after paying her bail as well, but she sells him on an angle which, if it comes off, will see her smuggling Robbie’s entire fortune into the country with the unwitting assistance of the very cops who’ve offered her a deal in return for helping them to catch him. The gun dealer is wary, but he wants his money badly enough to go along with her plan. Jackie has this habit of lifting one corner of her mouth as she talks so that her words are spoken through a crooked smile, but once or twice we see this carefully composed mask slip to reveal the fear and anxiety beneath the placid surface. They are moments during which Tarantino’s camera gazes closely upon the faces of his subject’s for longer than usual, and each time it does we know precisely what that person is thinking. It’s a trick that’s incredibly difficult to pull off – too much expression and the emotion is exaggerated, not enough and the moment loses meaning – but Tarantino’s cast pulls it off time and time again. Jackie has another potential source of salvation in the mellow form of Max Cherry (Robert Forster – Reflections in a Golden Eye, London Has Fallen), the bondsman through whom Robbie arranged the bail for both her and the luckless Beaumont Livingston. A gentle man in a tough business that’s finally starting to wear him down, Max takes an instant shine to Jackie. She tells him of her plan to con the police and steal Robbie’s half-million, and he agrees to help. But is she playing him, in the same way that she’s fooling Robbie and the cops? Unusually for Tarantino, there are only four killings throughout the entire picture, and three of them occur in the last half-hour. But less is more: they are brief and terse, and two of them are shockingly brutal, even though they are not particularly graphic. Tarantino demonstrates a previously unsuspected subtlety of judgment in these moments which, sadly, was completely missing from the Kill Bill movies that followed Jackie Brown. As always, Tarantino assembles an accomplished and eclectic cast of actors from whom he draws sublime performances. It’s Grier and Jackson who stick in the memory, and rightly so, but they receive sterling support from a large cast of supporting actors. Robert Forster, was rescued, like Grier, from relative obscurity to play the doe-eyed Cherry, whose natural insouciance masks a pin-sharp mind, despite the role being coveted by none other than Robert De Niro (Analyze This, Heat), who makes an impression of his own as Louis, Robbie’s deadbeat sidekick. It’s a role completely beyond the confines of De Niro’s comfort zone, one which calls on him to completely cast off the Alpha male status for which he was known, but as you watch him shuffle around the sidelines like a confused pup, it’s difficult to imagine him playing anything other than beta males. Bridget Fonda (Easy Rider) also scores a career best as Robbie’s druggie surfer chick girlfriend, Melanie, a cute blonde plaything with a flair for malicious teasing that eventually, shockingly, rebounds on her. On the down side, while Jackson’s performance is never less than mesmerising, his rapid-fire jive talk does stray dangerously close to parody at times (particularly when opposite Chris Tucker), and Michael Keaton (Toy Story 3), as the police officer leading the charge to bring Robbie down, seems unsure about whether he’s supposed to play the part straight or with comic undertones, and wavers uncertainly between the two. 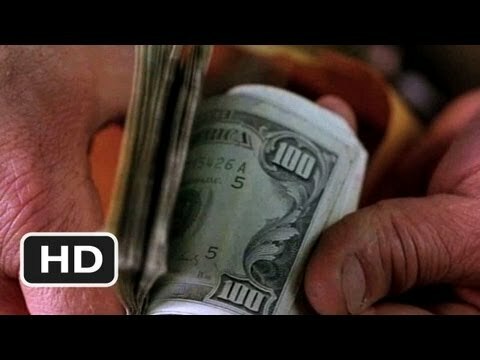 Jackie Brown is one of those timeless movies that holds up well on repeat viewings, and it could have been a four-star classic had Tarantino not fudged the ending by having a character who has demonstrated an admirable level of cunning throughout the movie suddenly leave themselves exposed and vulnerable just when they should have been at their most wary. Despite this disappointing climax, however, Jackie Brown remains one of Tarantino’s best movies to date. Click below for a free preview of the Kindle book, The Films of Chris Tucker. The book, written by the author of this review, features reviews of all of the actor’s films, and is available to buy, or to read for free if you’re a member of Kindle Unlimited.